Spectacular oceanfront cottage on Southport Island with 180 degree views of the Atlantic Ocean, Islands, Cuckold Lighthouse. Ledgemere has its own small beach with many treasures to find - driftwood, beautiful pieces of sea glass and small tidal pools. It is all about the views here with floor to ceiling windows in the main living area, screened dining porch, separate screened porch off several bedrooms. Watch sailboats, lobster fishermen, schooners and more passing right by you. Views looking to the left of the outer Boothbay Harbor entrance, Squirrel Island, Burnt Island, Fisherman's Island, Cuckolds Lighthouse and more. Great family vacation spot as well as a couple's retreat. Oceanfront cottage with fantastic views of Islands, Cuckolds Lighthouse, boating traffic and the Atlantic Ocean. 7-NIGHT MINIMUM REQUIRED. Off-Season Arrival & Departure dates may be flexible. Come spend your vacation at the edge of the sea. 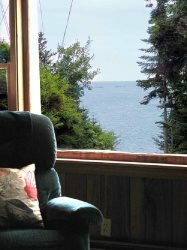 Ledgemere Cottage provides you with spectacular 180 degree views of the Atlantic Ocean, Fisherman's Island, Ram Island, Squirrel Island, Entrance to Boothbay Harbor, and Cuckolds Lighthouse - not to mention the boats you will enjoy watching. Walk down on the rocks to see what the ocean left behind as it comes and goes with each tidal change. Enjoy the majesty of a storm from the comfort of your living room. There is even a section of rock which creates a small salt water pool when the tide comes in and disappears as the tide recedes. Walk down the path to a small beach (shared with a neighbor), collect sea glass, or driftwood. Sun yourself on the sandy beach or on the large open deck overlooking the sea. Sit and enjoy the bird life - Heron frequent this cove. Eagles, Osprey and other birds are frequently seen from this cottage. Small, landscaped lot with the whole focus on the Ocean. Wake up each morning to the sights, sounds and smells of the ocean. Have a front row seat to enjoy the Fourth of July fireworks from one of the lovely screened porches (no worrying about parking or the mosquito's that way). "As little girls, we had to entertain ourselves. There was no television in our cottage. We were in nature, collecting starfish, snails, mussels and sea glass. We played on the rocks, playing house, tag, hide and seek and building forts. We walked to Newagen Harbor to go crab fishing. We collected moss in the woods to build terrariums. We took sailing lessons at Cozy Harbor on the west side of the island. Cozy Harbor is a beautiful small protected inlet. The Southport Yacht Club is located there and they give sailing lessons to children all summer long. A completely renovated, lovely restaurant for lunch and dinner. It also offers a Kayak launch. Kayaking has become popular all around the island. Close to Cozy Harbor is the Southport General Store. Pick up sandwiches, the paper, great coffee, wine, beer and whatever else you forgot from Boothbay. A small Post Office is located close by to the General Store. As children, we read constantly. We walked to the tiny two room Newagen library to check out the latest Nancy Drew book. Today the library has vastly expanded through the generous support of the people of Southport. It has become a center of the community and offers a fabulous selection of books and DVD’s along with notices of upcoming events, art shows, flea markets, etc. Our family always took boating trips and picnics with friends to any number of the scenic islands you see from our living room. We took commercial deep sea fishing trips and sightseeing trips around the islands and out to Monhegan Island, an enchanting artists’ colony. If it was a rainy day, we’d head into Boothbay to visit the shops and get a hot dog at Dunton’s Doghouse or visit The Ebb Tide for homemade strawberry or peach shortcake. Or we might stay home and play board games, and work on a jigsaw puzzle that would be left out over the course of our stay. Being in our cottage is like being on a boat. We perhaps have one of the loveliest locations on the island. Our view is a 180 expanse from Cuckolds Lighthouse to the Outer Islands, Squirrel Island, Spruce Point and up to Boothbay Harbor. The parade of lobster boats, sail boats, cruisers and yachts is a constant delight -- as is the nature; the eider down ducks, osprey, seals, the gulls and the songbirds and the chattering of the chipmunks. My sister and I feel so lucky to experience this enchanted place. We shake off the cares of our too hectic lives and are so grateful to experience this part of the world, so full of nature and free of the noise and din, hustle and bustle of 21st century America. We feel like we have a small piece of heaven. " Three generous size bedrooms, full bath and laundry room on the upper level. Two bedrooms share a small screened porch. Main floor houses the great room with its walls of windows to the ocean, a shower bath, kitchen and den (TV hides in here). Enjoy your meals on the screened dining porch just off the living room or open the wooden dining table in the great room to dine inside in style. This cottage has been in the family for five generations now. Original cottage which burned was built by the current owners' grandfather in the early 1900's and replaced after the fire by his son and enjoyed today by grandchildren and great grandchildren who are inviting you to share this treasure and make your own life-long Maine memories. A cottage to truly come "home" to each summer. BATHROOMS: (1) 3/4 bathroom with shower, sink & toilet on the first floor, and (1) Full bathroom with shower/tub combo, sink & toilet on the second floor. PETS ALLOWED? Yes, 1-2 small dogs allowed. No cats, please. Southport Island is a hidden treasure on the Boothbay Peninsula. Two miles from Boothbay Harbor, you cross the bridge onto the island and feel the world change around you. Rent kayaks locally or bring your own and launch them from right the property. Nearby you will find hiking trails, biking, the Southport Historical Society Museum and Southport Beach with views of Hendrick’s Head Lighthouse. Visit the Southport Memorial Library to check out the famous Ruby Slippers and learn about their connection to the area. While you are there, borrow a Rachel Carson book and explore some of her favorite spots on the island. Farmers markets and food stands are THE spot to buy fresh and local. Don't forget the seafood! Lobster abounds in this area and can be purchased at the many lobster pounds on the island, including Robinson's Wharf and Oliver's Restaurant. The Southport General Store is known for its breakfast pizza and sandwiches and extensive wine collection and gift barn. You'll want to come back again and again! The Boothbay Peninsula is a beautiful region rich in culture, history, all things nautical and of course it’s own unique niche in nature. The area offers ample opportunities for biking, kayaking, canoeing, fishing, charters and guided cruises, spas, a championship golf course and country club, mini-golf, bowling, museums, antiquing, hiking and walking trails. We have the Maine State Aquarium, the Coastal Maine Botanical Gardens and the Boothbay Region Land Trust with its 30+ miles of pet friendly trails in protected areas. All of our experiences with Cottage Connection have been first-rate from arranging a rental to seeking advice when the unexpected occurs I.e the owner's boat slips its mooring, no water due to a water main break to name a couple. Should an answer to a question not be readily at hand, staff calls the owner and gets right back with a solution. One can't ask for more! Simply delightful and now on our list of truly favorite properties. We hope to return! Past guest of Cottage Connection and when asked if they would recommend Cottage Connection to friends and family Judith wrote "Cottage Connection is a competent realtor, responsive to the wants and needs of the renter". When asked how we could serve them better? "All in all, it was a job well done on Cottage Connection's part". What was the best part of your vacation..., "beautiful house, fabulous view, delicious lobsters, quiet getaway". Swimming Area Rating 2/5: Water access only for agile young adults or adults, rocky shoreline or bottom, may be a hill down to the water or subject to strong currents.